5 happenings from the week. Cheers, we made it! 2. 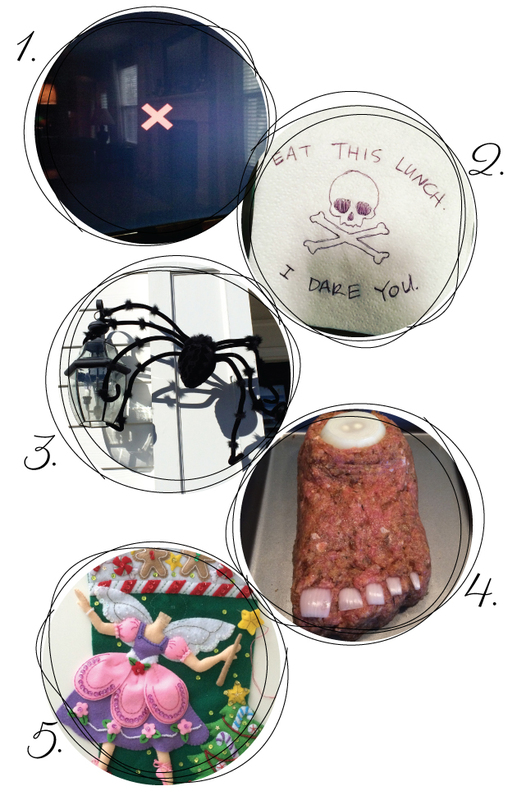 The kids are off school today, so yesterday marked the end of Halloween lunches. I think enjoy doodling on the kid's napkins just a bit too much! 4. Spooky Dinner is over! While I like to gross out the kids, I'm done with sculpting meat. I'll have to come up with something new for next year! 5. A few more steps closer to being done with the stocking! I finished the skirt, but had to improvise and do some recreating since the pink petals and the white belt weren't fitting the right way. Cue the uttering of bad words! Finishing the wand is up next. Here's to a great weekend! Happy Halloween! !